The explosive volcanic eruption Iceland saw in 2010 may have disrupted life in the air above Europe, but it apparently enriched life in the Atlantic Ocean, researchers say. 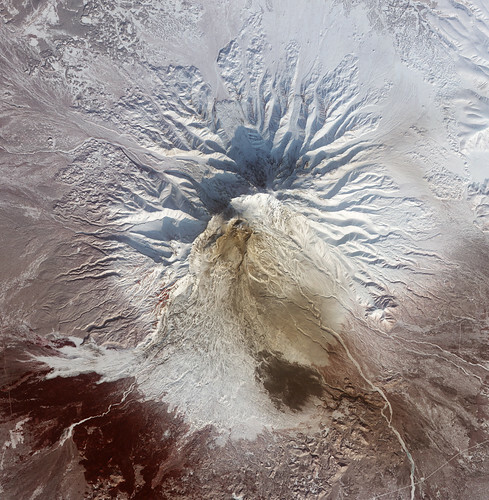 After nearly two centuries of dormancy, the volcano Eyjafjallajökull (AYA-feeyapla-yurkul) erupted many times over the course of 10 weeks three years ago. These outbursts spewed a giant plume of ash that spread unusually far and stayed for an oddly long time in the atmosphere,forcing widespread flight cancellations for days. Serendipitously, marine biogeochemist Eric Achterberg at the University of Southampton in England and his colleagues were taking part in a series of research cruises in the Iceland Basin region of the North Atlantic Ocean both during and after the eruption. These three cruises allowed the researchers to measure iron concentrations at the ocean's surface before, during and after the eruption in areas directly influenced by the plume of iron-rich ash. Iron is key to ocean life, helping spur the growth of single-celled organisms known as phytoplankton. Like plants, these organisms convert sunlight to chemical energy via photosynthesis and serve as the base of the food chain. In about a third of the global ocean, a scarcity of iron limits the abundance of life, so ash supplying this metal could spur booms in biological activity. Beneath the plume, the scientists found that peak dissolved iron levels were up to about 20 to 45 times higher after the plume than they had been before the ash came along. A model of ash dispersal rate that the researchers developed, along with measurements of iron dissolution, suggest that up to 220,000 square miles (570,000 square kilometers) of North Atlantic waters might have been seeded with up to about 100 metric tons of iron. The researchers also saw that after the eruption, levels of another nutrient, nitrate, were nearly completely depleted in the central Iceland Basin. That finding suggests that when volcanic iron fertilized the waters, the resulting phytoplankton bloom sucked up other nutrients as well. Since phytoplankton use carbon dioxide just like plants do, volcanic ash falling on the ocean could reduce levels of the greenhouse gas in the atmosphere. However, the team estimated that the plume from Eyjafjallajökull only triggered a 10 to 20 percent rise in carbon dioxide uptake by phytoplankton in the Iceland Basin compared to other years. In order for volcanic iron to have larger effects on the atmosphere, phytoplankton must really flourish. For that to happen, the researchers suggest, ash emissions have to be much larger and longer in duration and must occur over a region high in nitrate. The relatively modest effects that this volcanic iron apparently had on atmospheric carbon dioxide levels strike another blow against so-called geoengineering schemes that aim to reduce levels of greenhouse gases by adding large amounts of iron to the seas. "I'm not an advocate of dumping into the ocean to remove atmospheric carbon dioxide," Achterberg said. "It's not a very efficient process. You'd need so much iron to remove the man-made carbon dioxide emitted at the moment that it wouldn't be worth it." In the future, researchers could investigate the effects of volcanic ash on the Southern Ocean, which is relatively rich in nitrate. "There, you might see more of an effect when you add extra iron via ash," Achterberg said. "However, you'd have to be lucky to be at sea when a volcano erupted there. Our cruise was scheduled three years in advance, and it was just pure luck we were in the Iceland Basin when Eyjafjallajökull erupted." The scientists detailed their findings online March 14 in the journal Geophysical Research Letters.